COLLEGE STUDENTS ON CHARTER PLANE SHOT DOWN NEAR CUBA! This is an incident that was considered within Operation Northwoods. Do you trust your government ? Read on Serfs. Several other proposals were included within Operation Northwoods, including real or simulated actions against various U.S. military and civilian targets. Do you trust your government ? Is it feasible False Flag attacks have already happened on U.S. Soil ? I am not a Truther, but with all of the questions sorrounding 9/11 as well as the Timothy McVeigh OKC Bombing and The Gulf of Tonkin and Bay of Pigs, wait, did you know too many people do not know the Gulf of Tonkin was faked ? It was used to gather the American Public’s support for going to war with Vietnam. Yes, it was all fake and of course the Bay of Pigs was pure CIA operated to overthrow Castro. Makes one wonder why Cuba wanted missiles on the island. Was it to attack us ? Or was it to defend itself in the event of an American attack ? One must look at these questions from other perspectives to fully understand them. The False Flag is nothing new. Hitler himself had the Reichstag burned to the ground. The most interesting and quite startling false flag attack plan by the US that was thankfully never implemented was Operation Northwoods. When you read theinformation from that plan (PDF), you won’t believe your eyes. In the 1931 Mukden incident, Japanese officers fabricated a pretext for annexing Manchuria by blowing up a section of railway. Six years later they falsely claimed the kidnapping of one of their soldiers in theMarco Polo Bridge Incident as an excuse to invade China proper. In the Gleiwitz incident in August 1939, Reinhard Heydrich made use of fabricated evidence of a Polish attack against Germany to mobilize German public opinion and to fabricate a false justification for a war with Poland. This, along with other false flag operations in Operation Himmler, would be used to mobilize support from the German population for the start of World War II in Europe. On November 26, 1939 the Soviet Union shelled the Russian village ofMainila near the Finnish border. The Soviet Union attacked Finland four days after the Shelling of Mainila. Russia has agreed that the attack was initiated by the Soviets. Also, the nearest Finnish artillery pieces were well out of range of Mainila. In 1953, the U.S. and British-orchestrated Operation Ajax used “false-flag” and propaganda operations against the formerly democratically elected leader of Iran, Mohammed Mosaddeq. 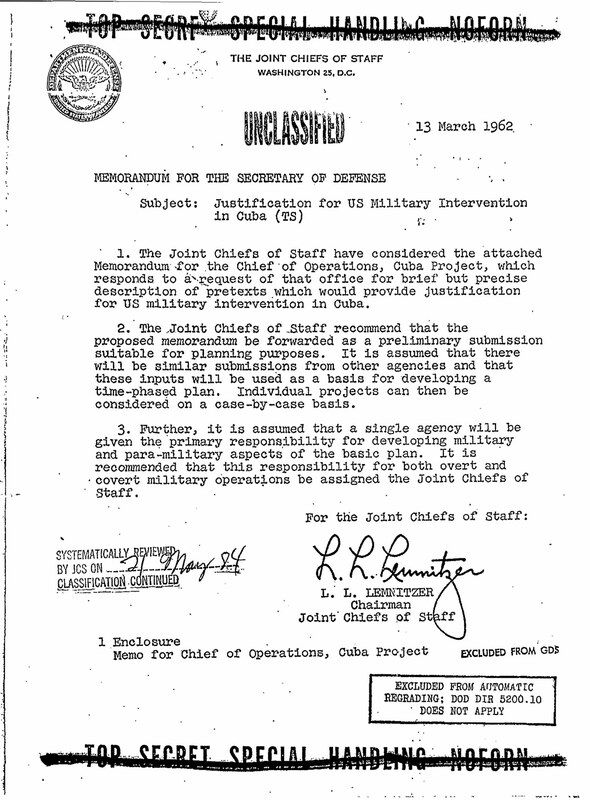 Information regarding the CIA-sponsored coup d’etat has been largely declassified and is available in the CIA archives. In 1954, Israel sponsored bombings against US and UK interests inCairo aiming to cause trouble between Egypt and the West. This operation, later dubbed the Lavon Affair, cost Israeli defense ministerPinhas Lavon his job. The state of Israel (where it is known as “The Unfortunate Affair”) finally admitted responsibility in 2005. The planned, but never executed, 1962 Operation Northwoods plot by the U.S. Department of Defense for a war with Cuba involved scenarios such as hijacking a passenger plane, sinking a U.S. ship, burning crops and blaming such actions on Cuba. It was authored by the Joint Chiefs of Staff, nixed by John F. Kennedy, came to light through the Freedom of Information Act and was publicized byJames Bamford. Former GRU officer Aleksey Galkin, former FSB officer Alexander Litvinenko and other whistleblowers from the Russian government and security services have asserted that the 1999 Russian apartment bombings that precipitated the Second Chechen War were false flag operations perpetrated by the FSB, the successor organization to theKGB. Galkin has since recanted his accusations, which were made while he was a prisoner of Chechen rebels. However, there are other theoriesthat the FSB engineered this incident. With all of the SOF training going on, it does make connecting the dots fun.